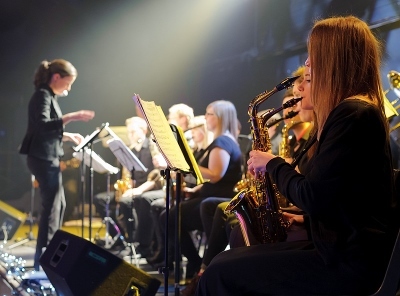 Welcome to the official homepage of Glasgow University Big Band! We are currently updating our website so for the most up to date information please follow these links to our facebook page and our twitter. You can also email us at gubigband@gmail.com for queries and to book the band. 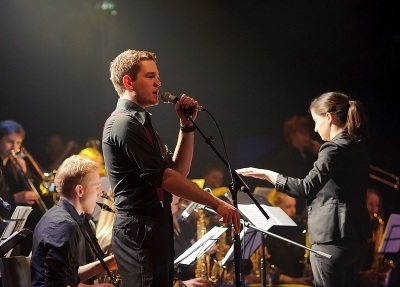 We are a jazz big band who play all styles of music, from classic big band sounds to funk; from latin to blues and soul. We play several gigs a year including the University of Glasgow Music Club Concerts. We have performed two years in a row at Glasgow Loves Xmas in George Square, three years in a row at the West-End Festival, we host our own jazz night annually and we are increasingly being asked to play at both university-organised and external events. Wednesday evenings in the University Concert Hall, 6-8pm. We have a tendency to head out for a sociable drink at the pub afterwards. We also organise a number of other social events throughout the year. Some of the socials that were organised this year include:- go-carting, Xmas Dinner and a quiz with pizza night. Interesting in booking the band or finding out more about us? Contact us via gubigband@gmail.com, and we'll get in touch with you as soon as possible. Are we looking for new players?